The current CPR guidelines for pregnant women are the same as they are for other adults. However, some changes are recommended. Ultimately, the best place to find out about the guidelines is through a training class. CPR stands for cardiopulmonary resuscitation, a procedure used in emergencies. The lifesaving strategy is designed to keep circulation flowing when a person is in cardiac arrest. Cardiopulmonary resuscitation is implemented until medical help arrives. The procedure has two basic components: breathing and chest compressions, alternating between the two. The procedure begins with 30 compressions followed by two breaths of air, followed by 30 compressions, and so on until help arrives. Cardiac arrest is life threatening and, when a pregnant woman experiences this episode, the baby's life is at risk as well. Getting immediate treatment is critical for both mother and child. The current CPR guidelines for pregnant women is the same as for any other adult when it comes to giving CPR outside of the hospital setting. See CPR in Three Simple Steps for general guidelines for adults. A Pocket Guide is available to print as well. 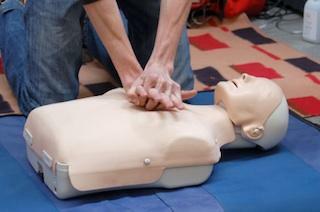 It is best to take a CPR training class in order to learn the specific steps to implementing the procedure correctly. Online resources may offer general guidelines and suggestions but the best place to learn how to perform adult CPR is through a local training center or class specific to the field. Changes in the CPR guidelines are not restricted to pregnant women. Two major changes involve timing the onset of the procedure and whether or not to alternate breathing with compressions. In 2005, new guidelines for CPR include beginning the treatment before the patient's pulse stops. This makes it necessary for the person implementing the emergency procedure to begin without using the heart stopping completely as a starting point. In addition, the American Heart Association suggests using Hands Only CPR, which involves chest compressions without alternating with breathing when inexperienced or apprehensive. The best way to become familiar with the current CPR guidelines for pregnant women is to take a CPR class in your area. This is especially important for partners of pregnant women experiencing pregnancy complications. The American Heart Association is a great place to start. The American Heart Association has created Emergency Cardiovascular Care Programs that offer training and support for people working in the healthcare field, the workplace, and in the community. The programs include training for instructors as well. The American Red Cross offers online training for people who prefer this convenient approach. Visit the site and select your state to find out how to register in your area. The Resuscitation Council offers courses for residents in the United Kingdom. Visit the sites for publications and course materials and information for taking CPR classes. In the event of an emergency, it is extremely important to call for help immediately. See the Mother of All Pregnancy Books for more information about pregnancy, conception, and birth.